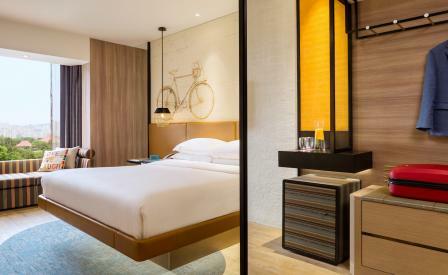 Tucked away on a quiet stretch on Singapore’s famous Orchard Road, the former Traders Hotel has just emerged from a $31.5-million makeover that sets the style standard for the burgeoning Hotel Jen group. Called Jen Tanglin, the 565-key property’s bold, vibrant interiors are thanks to Hong Kong-based firm BTR, who graced the guest rooms with feature walls painted with local references such as bicycles, shophouse doors, orchids, and goldfish. Meanwhile, denim-clad chairs, steampunk-ish lamps, gold-wire pendant lights, white marble tables, and abstract-pattern area rugs give the space plenty of contemporary flourishes. The same kind of mix-and-match texture can be experienced in the public spaces, but this time, with quirkier touches of whimsy; the communal tables at the casual dining space Jen’s Kitchen On-the-Go, have vintage bikes for legs and antique luggage trunks are used as the check-in desks. Most of the furniture and accessories used throughout the hotel were custom-made by BTR, but a cadre of international designers were called on for reinforcements, from Swedish brand Bolon for the rugs to animal-shape planters from Kenneth Cobonpue.